There are two things which often sabotage a self-organised Three Peaks Challenge: Poor navigation and not having the right kit and equipment to deal with whatever the mountains can throw at you. Our Three Peaks Challenge training courses will put you right on both counts! This is an opportunity to spend two days with us in the mountains of Scotland, the Lake District or Snowdonia, during which time you’ll learn to confidently use a map and compass, discover how to prepare your kit and clothing, gain insight into the best foods to fuel your challenge and be given a 16 week Three Peaks Challenge fitness training plan developed specifically for us by an elite athlete coach at Loughborough University. You’ll also have the benefit of being able to recce the route up and down one of the Three Peaks Challenge mountains at challenge pace under the watchful eyes of a local Mountain Leader. Day 1: An opportunity to learn some navigation skills, discuss kit and equipment, packing your rucksack, nutrition and hydration, physical fitness plus strategies for a successful challenge. 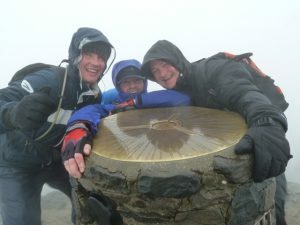 Takes place on and around Ben Nevis, Scafell Pike or Snowdon. Duration 6-8 hours. Day 2: An ascent of Ben Nevis (via Pony Track), Scafell Pike (from Wasdale Head) or Snowdon (via the Pyg Track) with an opportunity to test your kit before your challenge, discuss pacing strategies, plus practice some of your new found navigation skills with an experienced Mountain Leader. Duration 6-7 hours.